I've taught a lot of knitters over the years, but my recent knitting lessons were my most special. I gave two of my grandkids their very first lesson. Makayla is 4 and wanted to learn. Her attention span is short at this age and that's fine, and she's a lefty so it was a bit harder for her. It doesn't matter. I'll continue to teach her as long as she wants to know how to knit. Braydon caught on very quickly and said that he liked knitting so much! I started by casting on a few stitches and knitting a couple of rows for both of them. They can learn the cast on later. 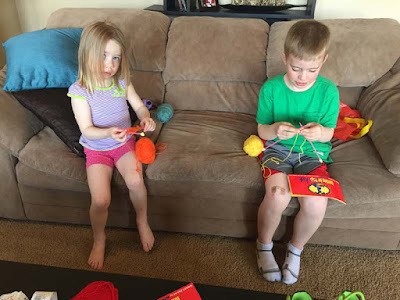 For now, I just wanted them to learn and practice the knit stitch. Braydon, who is 7, wanted to do it himself after he was shown how...and he did well. 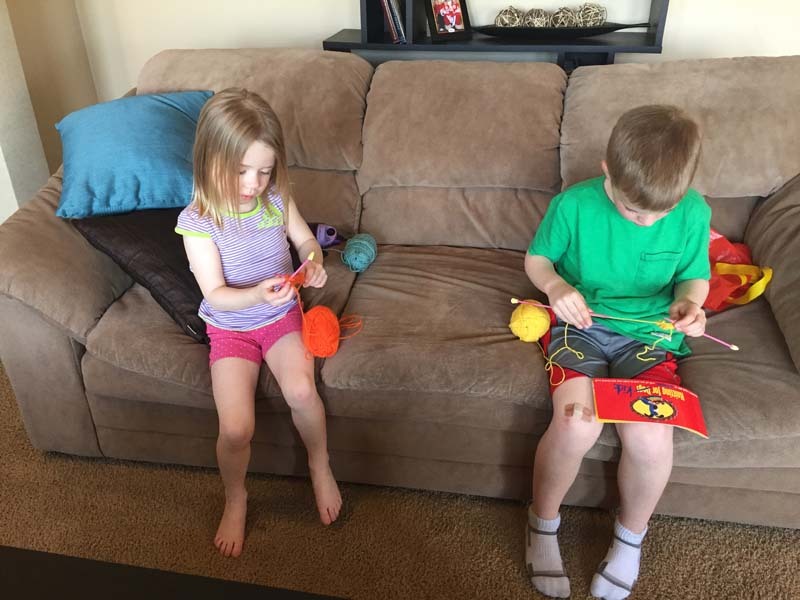 Both were happy with their little knitting kit which included a set of 4 mm plastic needles, 4 colorful balls of DK weight yarn, a little Gromit the Dog instruction book and a red plastic bag with yellow handles to keep it altogether. I bought these little kits a number of years ago - I don't remember where. I'll have to keep my eyes open for another kit for granddaughter #2 who is just 1. I've often heard people say that they learned to knit from their grandmother. At the time I never thought that someday I would be that grandmother, but I am so happy that I am.